What were some significant events in Baker‘s career that led up to his transition from an attorney to a politician? In 1968, after 14 years of marriage, tragedy struck the Baker household: Mary Stuart was diagnosed with inflammatory breast cancer. Fifteen and a half months later she died, and Jim Baker became a widower, faced with raising four young boys on his own. Bush lost that senate campaign, but Baker got his first taste of politics and was hooked. He also began to rebuild his life. He started dating a friend of Mary’s named Susan Winston, a divorced mother of three. In 1973, Baker and Winston married, forming a household of nine – two adults and seven children. Later they would add another daughter to their family. 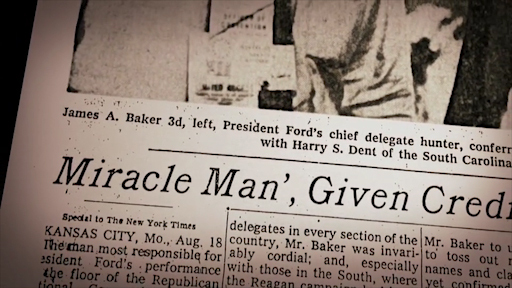 Gerald Ford ultimately lost his presidential bid to Democratic challenger Jimmy Carter, and the Miracle Man returned to Houston. But Baker had caught the political bug. He decided to run for the position of Texas’ attorney general. Baker campaigned hard, but ultimately lost. It was his first and last time as a candidate. Just days after Baker’s political campaign ended in defeat, George H. W. Bush called. This time, Bush asked Baker to head up Bush’s 1980 presidential bid. Baker took the job. It was an uphill battle; Bush was running against Ronald Reagan, the popular movie star turned governor who had narrowly lost the Republican nomination to Ford four years earlier. Though Bush enjoyed some early success in the primaries, as the primary season wore on, it became clear that he was unlikely to defeat Reagan for the party’s nomination. But Baker was thinking ahead -- if Bush couldn’t be the presidential candidate, perhaps he could be Reagan’s running mate. On the eve of the California primary, Baker made a strategic decision to leak the news that the Bush campaign was out of money. Bush was furious; Baker’s leak effectively ended his presidential bid. But in the long run, Bush was also grateful to his friend. Baker had set in motion the possibility that Reagan would pick Bush to be his vice president. At the Republican National Convention in July 1980, Reagan called Bush, asking him to be his vice presidential running mate. Baker’s plan had worked. In the November general election, the Reagan/Bush team was elected into the White House with a landslide. James Baker would be heading back to Washington. Over the years, Baker played pivotal roles in several presidential campaigns. Learn what role he played in the 2000 Bush/Gore presidential election. Jim Baker had the difficult job of keeping delegates committed to Republican presidential candidate, Gerald Ford. 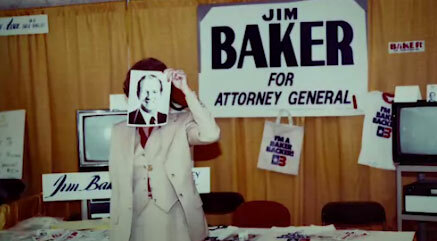 Jim Baker ran for Texas attorney general. It was the first and last time Baker was a political candidate.